For drawing FDG F-18 from a vial into a syringe. 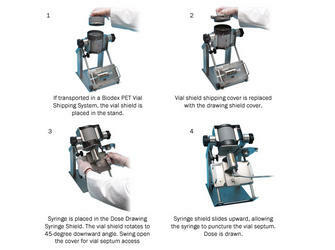 The Dose Drawing System is used to draw FDG F-18 doses from a vial. It consists of a specially designed Dose Drawing Syringe Shield, vial shield and stand. When drawing FDG F-18, the vial shield and syringe shield remain on the stand. The stand allows the vial shield to rotate and has a fixed stop at the 45-degree downward angle. The vial shield is constructed of 1" lead encased in steel. The shield's top is threaded to allow quick insertion and removal of vials. The top cover incorporates a pivoting shield for septum access that allows the use of a vent needle, if desired, along with the needle from a 5 cc syringe. 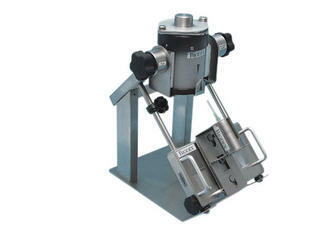 The tungsten syringe shield mounts on a stainless steel rotating platform that slides the syringe into the vial and locks in position. The dose can then be drawn with forceps to minimize hand exposure. The syringe shield is constructed of .55" tungsten. A high-density lead glass window allows viewing up to the 5 cc mark on a 5 cc syringe. 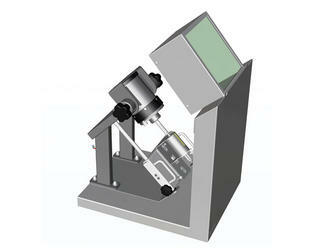 The PET Dose Drawing System provides a safe and shielded environment while making it easy to draw a FDG F-18 dose.